Yesterday Joe Meno and I judged the LEGO entries for the 2012 North Carolina State Fair. A few surprises this year and one story to share. Overall it seemed to me the number of entires was up this year. In particular, the number of entries in the North Carolina theme category was up as compared to last year. Much to our surprise, the number of entries in the 10-18 “Original” category was the lowest we’ve ever seen. Unfortunately we had to disqualify one entry this year and it is very good one. This model of the USS North Carolina, while excellent in every detail, is not original work. 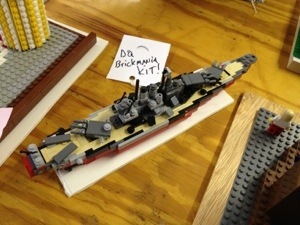 It is a kit designed by Daniel Siskind of Brickmania which is available for sale. Just about every year we have to disqualify one or two entries usually due to the entry being all or largely comprised of an official LEGO set, this is the first time we’ve seen an after market kit entered as original work. In years past we’ve seen copies of well known models from the Internet submitted as original work and had to disqualify them as well. Maybe we need to clarify the rules in the NC State Fair Premium Book but “original work” to us means it should be the builders own creation, not a copy of someone else’s creation. This entry actually got past me, I didn’t recognize it. Fortunately Joe Meno recognized it immediately being familiar with the Brickmania kits. I am sure people visiting the fair will be curious as to why such an excellent model, which it is, didn’t win. There were a lot of great entries so if you get to the Fair this year make sure you stop by the Hobbies and Handicrafts building as check out the LEGO entries! This entry was posted in Events, LEGO, NC State Fair and tagged judging, LEGO, NC State Fair. Bookmark the permalink. Hey Mike – I have tried in vain to find an email contact for you here, but I’d like to talk to you for a story I’m doing on the Lego contest at the Fair. You have my email. If you’re interested, let me know. Thanks. Sorry I didn’t see this sooner – do you still want to speak with me?